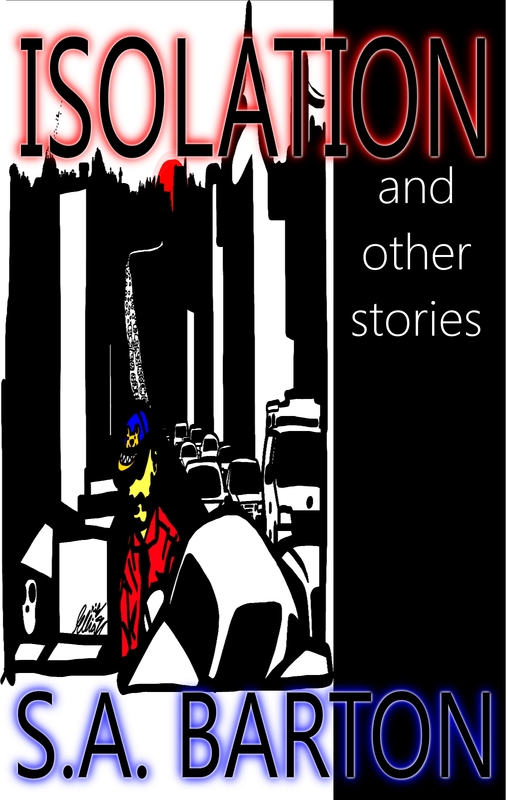 The unused first cover draft of Isolation and Other Stories. Isolation features a nicely creepy dream sequence, a scene from which is depicted here by artist and loving stepson Erik Elliott. I really enjoy putting a good dream in a story. In a sense, of course, every piece of fiction is a dream, a vision the author has transmitted into the mind of the reader via the written page. That’s not the sense of it that I’m talking about here, though. I’m talking about showing the reader the dream of a character. Dream sequences in fiction do not have a particularly good reputation. In television and films as well as writing, they are often seen as either being a corny, tired, old trope, or as being cop-outs in which action happens and then the audience discovers that none of that action really mattered. And the audience, generally, is not amused. That in mind, I do not write dream sequences casually, nor do I use them often. They have to fit in the story logically; given their reputation, you can’t just cram one in there and expect not to be heckled for it. When I contemplate including one, I think hard about it. I second-guess myself. And when I return to the story to edit, I give the dream sequence a very critical eye. And yet, I’ve included them in Isolation, as I noted above. There’s one in The Tomatoes Bloom in Winter, which also appears collected in Hunger. There’s one in Flayed, which I will likely be publishing in the next few weeks. I’m working on a story now, working title Empty Plastic Father, which opens with one. I’m probably forgetting one or two right now, too. I’ve produced dozens of stories, and I can think of only five times I’ve written a dream sequence that stayed in the story after editing (I’m 99% sure the one in Empty Plastic Father is staying). So, caution is the word in writing dreams into a story. Why bother, if they’re so dicey to include, if they’re such tired old tropes? Well, they’re great for adding personality to a character. What says more about you than your dreams? Carl Jung, I think, would approve of the dream sequence for revealing what a character is all about. Dreams are great for foreshadowing and explaining a character gaining insight into a situation. Due to the way the human mind works, we often know more about things than we can hold and analyze in our conscious minds. We put puzzles together in our dreams, make connections that elude us when we’re awake. How many great discoveries in history have been made in dreams? And now that I’m writing about it, how many times have I been stumped on how to continue or conclude a story, slept on it, and awakened with my answer? Dreams are also an opportunity to step outside the frame of the story for a moment. I don’t mean in a fourth-wall-breaking sort of way, though you could certainly do that if you were writing a fourth-wall-breaking sort of story. I mean that things can happen in a dream sequence that would not be credible in the frame of your story. For example, Isolation is a story set in a near-future world without any supernatural elements, and it reads like one. In the dream sequence, wildly unlikely and surreal things happen. At first they’re small things, and they grow larger and stranger as the dream advances. I couldn’t include them and the in-story insights they point to without breaking the readers’ suspension of disbelief, because in a reality-based near-future story like this one very little suspension of belief is required. And that leads me to a final caveat about the dream sequence. I don’t think readers like it when a dream sequence gives no clue within itself that it’s a dream sequence; I touched briefly on this point at the start, and I’ll end with it because, as a writer, I think it’s a very important thing for a writer to remember. If you don’t drop some clues to your readers that they’re reading a dream sequence, then they read the whole thing as if it’s the main story, and then you throw their perception of the story into a cocked hat and they feel totally derailed. And probably half of them will throw your book into the corner with a muffled dammit and never pick it up again. They’ll wince the next time they see your name. So my caution on using a dream sequence: give your readers a clue that they’re reading a dream sequence along the way. I recommend dropping some small hints near the beginning, make it a little plainer in the middle, and make it really clear as the dream comes to an end. That way, you accomplish several things: your reader doesn’t feel deceived and betrayed. Your reader has the satisfaction of figuring out for themselves that they’re reading a dream before you tell them. And your reader can appreciate the content and clues in the dream sequence because they haven’t thrown the book into the corner and cursed your dreaming name.